A Japanese spacecrafttouted to be the largest aimed at the moon since NASA's Apollo era rocketedinto space late Thursday on an ambitious mission to study the origins ofEarth's nearest neighbor. The three-tonKaguya lunar orbiter rode its H-2A rocket moonward at about 9:31 p.m. EDT(0131 Sept. 13 GMT), though it was Friday morning at Japan's island-based TanegashimaSpace Center launch site. The probe was slated to circle the Earth twice beforebeginning a five-day trek to the moon, the Japan Aerospace Exploration Agency(JAXA) has said. Formally knownas SELENE, short for SELenological and ENgineering Explorer, Kaguya carries 14science instruments and two small microsatellites to make detailed maps of themoon's surface, probe its interior and study the lunar gravitational field. "Allof the data gathered by Kaguya will bring us new scientific knowledge forresearch of the origin and evolution of the moon," JAXA's SELENE projectmanager Yoshisada Takizawa has said on the agency's Web site. Kaguya isnamed after Kaguya-hime, a moon princess in a well-known Japanese folktale, andis carrying names and messages from people on Earth as part of JAXA's"Wish Upon the Moon" campaign. The probe is also equipped with ahigh-definition camera that is designed to record still and video images of theEarth as it risesabove the lunar surface. "Themoon is one of the favorite planetary bodies for Japanese," ShinichiSobue, a JAXA Kaguya science coordinator and spokesperson, told SPACE.com. "I think the Japanese people are looking forward to this, and especiallyto see the Earth rising from the moon." Kaguya's 55billion-yen (about $480 million) mission is slated to run about one year, Sobuesaid. The mission's launch comes after eight years of development and a seriesof delays, most recently due to improperlyinstalled condensers on Kaguya's small satellite passengers. Bad weather atthe probe's launch site also prevented a planned Wednesday night liftoff, JAXAsaid. While Kaguyais not Japan's first unmanned lunar mission, it is the country's mostambitious. In 1990, Japan launched the Hiten spacecraft to make a series of lunarflybys, deploy a small Hagamordo satellite near the moon and enter lunar orbit.Hiten was intentionally crashed into the moon in 1993. Sobue saidHiten's flight primary served as a technology test for future spacecraft,making Kaguya Japan's first all-science mission to the moon. 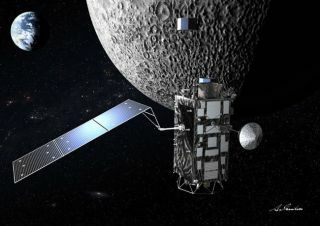 JAXA will share theprobe's gravity field measurements with NASA researchers in the U.S. - who arepreparing to fly their own Lunar Reconnaissance Orbiter (LRO) to fly next year- and is looking ahead to possible manned moon expeditions in the future, Sobueadded. "[JAXA]is exploring the possibilities to perform manned activities on the moon and toutilize the moon for future space development activities," Takizawa hassaid in past statements. Sobue addedthat Kaguya's SELENE effort is part of JAXA's larger space explorationinitiative to participate in international manned lunar missions and launch anunmanned Japanese moon lander by 2010. "We hopethat, by using our SELENE data, we'll find a good place for a future lunar landing,"Sobue said. Kaguya isthe first of a series of new moon missions by different countries to fly overthe next two years. China's Chang'e-1lunar orbiter is slated to fly sometime later this year, while NASA's LROand India's Chandrayaan-1 are due to lift off in 2008.